PRAYER PROMPT ••• This is the first year I’ve ever chosen a word as a theme. It has been my focal word. “Selah” is used at the end of various psalms, but Biblical scholars aren’t 100% sure what it means. I think God knew I needed this word this year. He knew I needed an ongoing reminder to take time to pray and praise Him. I’m in one of the busiest seasons I can remember… I started a new job; am still writing for my old job; I have my volunteer responsibilities at my church and with Proverbs 31 Ministries; and of course, my family and friends are always priorities for me. 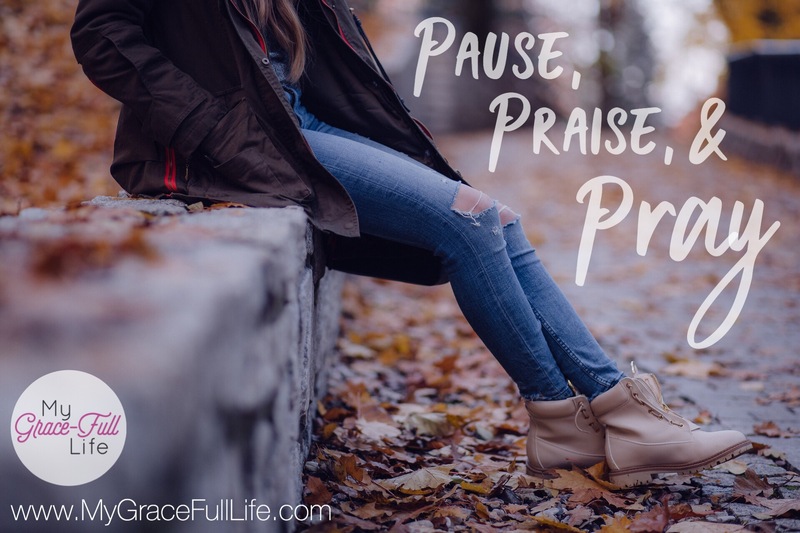 We have to pause, praise, and pray. Today, as you pray, ask God to show you where there are moments to be paused. Ask Him to remind you that prayer doesn’t happen once and then you can check it off the to-do list… it’s a constant ongoing thread that should be included in every part of your day. And praise Him that through Jesus, you can bow before the throne of God at any time, any day, any place, and any time. Denise, this is a beautiful post, friend! I like your word Selah. I think I needed this today. I’m also in one of my busiest seasons ever. So important to pause and pray throughout the day.